Description: Natural light filled 2 bedroom 2 full baths condo in desired Leisure World, 55+ community. Sliding glass doors to large sun room with fabulous view. Conveniently located near elevators. Extra storage cage in underground parking garage Rm#4 Bin #147. Plenty of parking located around the building as well. 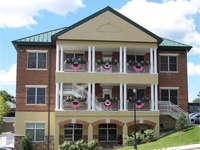 Monthly Condo fee offers many amenities in Leisure World. Come relax and enjoy it is your time!